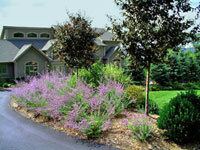 What are my favorite paving materials that I love to use as a landscape designer? No, it is not pavers. It's not that I dislike them. I just feel there are many other materials available for patios, walkways, and driveways that are more interesting and natural. Yes, I think it's the natural aspect of them. To put it simply, pavers are made out of concrete. They are man made. And I am a sucker for natural stone. I just love the look of it, the feel of it, and knowing that it came from the earth. 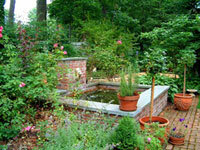 The disadvantage is that natural stone is more expensive than pavers. 1. Bluestone - you can choose regular, geometric shapes and use all the same sizes, you can mix the shapes and sizes, or you can select irregular shapes. 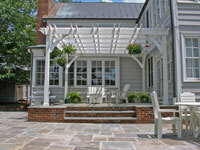 Bluestone can be dry laid or laid in mortar. I prefer dry laid as it is less expensive and easily fixed if anything moves over time. In addition there will be no cracking of concrete in the joints. 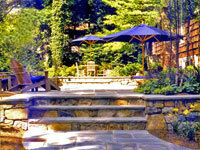 Bluestone is good for patios and walkways. I don't use it for driveways as it is not a strong enough stone. In addition, it is hot on your feet so I do not recommend it for pool decking. 2. Travertine Pavers - this is a beautiful natural stone, which has been cut into paver shapes. Typically it is dry laid. 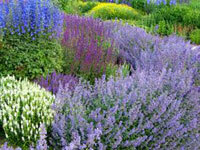 There are many different qualities, so be sure of where you are purchasing from. (You can always contact me for help.) They come in many different shapes and colors. There is also matching bullnose for pool projects. Travertine pavers resist freeze-thaw condition so will not crack and are cool to the touch. 3. Idaho Quartz - This is a quartzite stone that is extremely hard. It is also cool to the touch. It's shape is usually irregular and is best laid in mortar. Idaho quartz stone does have a "glitz" to it, so may or may not work for your project. However, it is quite beautiful. There are some more, but those top my list for beauty and durability. As far as costs go, from least expensive to more expensive it is travertine pavers, dry laid bluestone, bluestone set in mortar, and lastly, Idaho quartz set in mortar. 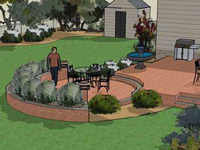 By the way, if you have any questions and you missed it on my site, I have a Question and Answer section on two of my pages....Landscaping Ideas and Patio Designs. I answer all questions personally and visitors can contribute also. So I'll look forward to hearing from you!